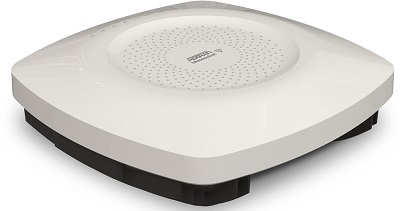 The new ADTRAN Bluesocket 3040 series is aimed squarely at the latest generation of 802.11ac Wave 2 wireless and smart devices. This update to the Bluesocket product line was designed to make ad-hoc and BYOD networking easier, while adding improved support for low-power "Internet of Things" (IoT) devices. Both the Bluesocket 3040 and Bluesocket 3045 models feature 4x4:4 MU-MIMO antenna technology, with four separate radios for maximum bandwidth. Sensitivity on the radios has been upgraded substantially over previous Bluesocket models, specifically to compensate for the weak radios on many IoT products. Maximum bandwidth on both models is 2.5Gbps. Additional radios add low-power Bluetooth, dynamic RF management, and Wireless Intrusion Detection support. The Bluesocket 3040 features a total of 10 internal omni-directional radio antennas for simple all-in-one deployment. The Bluesocket 3045 has two internal radios for system use, and 8 RP-SMA external antenna ports for external or directional antennas. Either model is an excellent choice for growing businesses, hospitals, hotels, restaurants, and other venues which see a large amount of traffic utilizing WiFi devices. For additional details, download the datasheet, or explore the product pages for more in-depth discussion. Only Available on Bluesocket 2020, 2030, 2035, 2135, 340 and 3045 Access Points. Need help? Just contact Hummingbird Networks with your questions!